This guild / clan name generator was created by Nick Yee. Guild names below are generated from a grammar that captures the syntax of most guild names and with a weighted vocabulary drawn from about 22,000 guild names from 5 World of Warcraft servers. What's Your Gamer Motivation Profile? Using data from over 140,000 gamers around the world, we've created an online profile tool for gamers. Take a 5 minute survey and get a customized report of your gaming motivations. 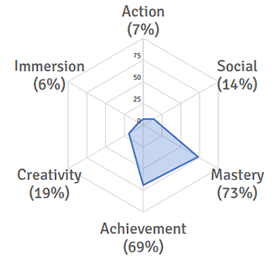 Take the Gamer Motivation Profile or see a sample report. Refresh this page for another 50 randomly-generated guild / clan names.